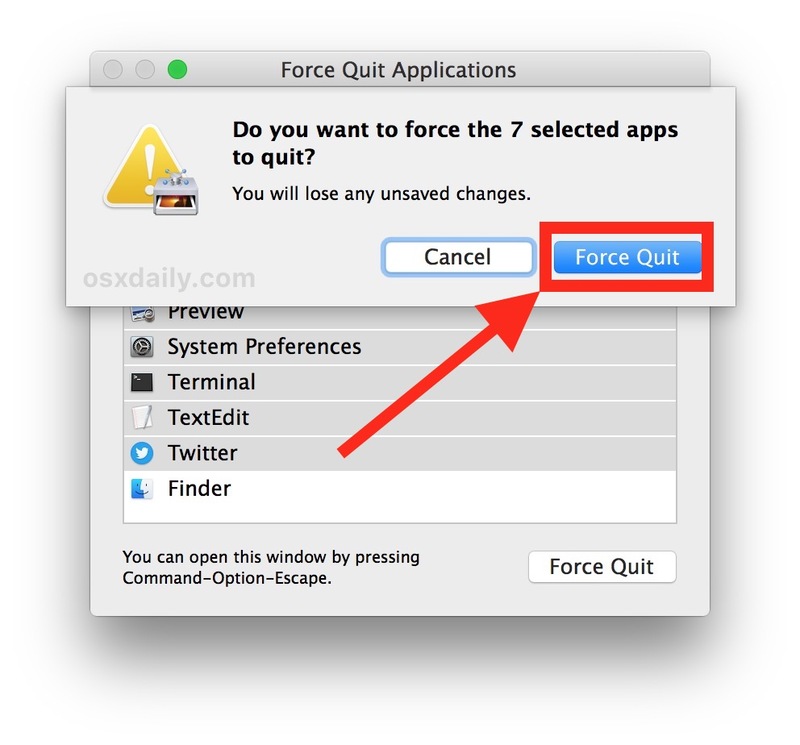 You probably know the various different methods for how to force quit apps on the Mac by now, but a lesser known capability is that Mac OS allows you to force quit multiple apps at the same time. This can be a great trick when troubleshooting, as well as a just a nice way to quickly force a few different apps to exit if you don’t want them open anymore. For example, if you want to force quit out of both Safari and Chrome concurrently, you could to that. Or if you have multiple Mac apps that are acting up and stuck on the ‘not responding’ beachball, you could cause them to each force quit at the same time. Keep in mind that force quitting apps typically does not save any data in the app being closed, thus it has the potential to lead to data loss from the app that is being forcibly exited from. Accordingly, forcibly quitting multiple apps is best used for troubleshooting purposes and is therefore not a reasonable approach to simply exiting apps, you’d want to just close them as usual with a standard Quit procedure. Users can force quit two apps, three apps, four apps, or more, it’s just a matter of how many you select to force quit. You can also use the Shift key to select multiple apps to quit if they are contiguous to one another, similar to how you can select multiple contiguous objects in the Finder with Shift. You can even technically forcibly quit out of every open app with this approach just by selecting all of them and forcing them to quit, but keep in mind that doing that leads to the apps not closing gracefully and with no chance to save. If you do find yourself wanting to do that often you may want to use this Automator trick to quit all open Mac apps instead too, which automates the process and prevents you from having to manually select all apps. 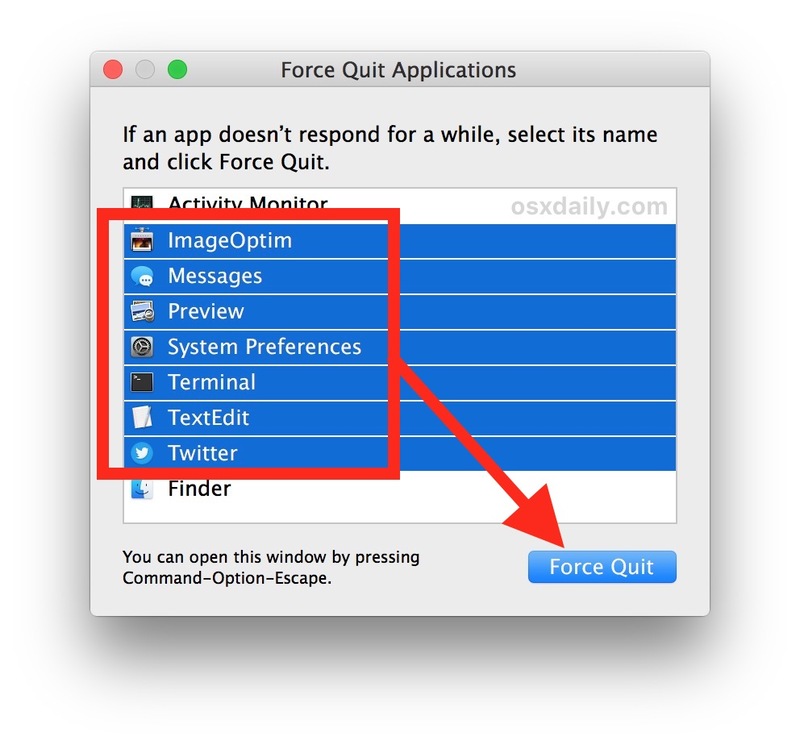 Outside of using the command line, this is perhaps the easiest way to forcibly quit out of multiple Mac apps concurrently and with minimal effort. This is a trick that I’ve noticed virtually nobody knows about, but it’s quite helpful for many situations, so use it when you need to, or just focus on single apps to force quit as usual if that’s more appropriate. IOW the standard multi select command that has been for Apple OS and OSX for decades….seriously? If you need to read an article to learn this you need some BASIC education on OSX features. …and for learning some MacOS basics, OSX Daily articles are a very useful resource. BASIC education is what OSXDaily’s mission is, and has been for over 10 years. You may have outgrown the daily tips here, and good for you.